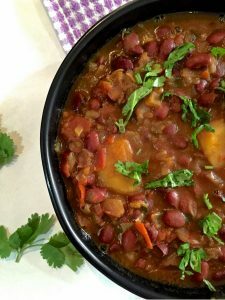 Red Veined sorrel leaves are the base for this delicious Bean Sorrel Soup, made in the French style. 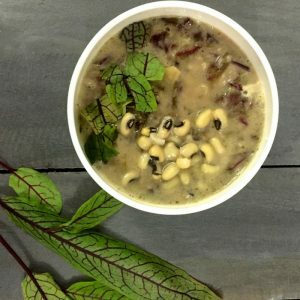 Nutritious as well as having the cancer fighting properties of the sorrel, this is actually a 2 Bean Sorrel soup as it is made from fresh sorrel leaves, french beans and black eyed peas. Ever since First Agro Farms and their marketing unit Sakura Fresh started supplying households in Bangalore with their zero pesticide and non GMO produce, I have been able to create recipes with fresh greens and herbs many of which are not commonly available here unless imported and at astronomical prices. It is a good feeling to be able to access global ingredients grown locally and that too fresh and without chemical contamination. A native of the mediterranean coast, sorrel has been known to be cultivated for centuries. The leaves have a sour, faintly citrusy taste which is reduced when sautéed and wilted to add to salads, or otherwise cooked. The plant with long arrow shaped leaves were grown in Europe as garden sorrel, until the cultivation in Italy and France during the Middle Ages of a milder variety with round leaves which is now known as French sorrel, was developed in Italy and France in the Middle Ages. By the end of the 16th Century, French sorrel became popular in England. It is said to have been very popular during the reign of Henry the VIII. Wikipedia describes the different ways that sorrel is used in various regions of the world: In sour soups or added to spinach and lettuce in salads, or in sandwiches, in Eastern Europe, green borscht in Russia, Soups or even with mashed potatoes and in a dish with herbs and eels in Croatia and Bulgaria. It is one of the ingredients for spankopita in Greece, along with spinach, chard and leeks. In Northern Nigeria it is again added to stews along with spinach, or steamed for salad along with roasted peanut cakes, onion and tomatoes. In Vietnam it is added fresh to lettuce and in salads for Bánh Xèo. It is popular in Brazil taken raw in salads or else in soups. In Albania, the sorrel leaves are simmered and served cold marinated in olive oil, used in soups, and even as an ingredient for filling byrek pies (byrek me lakra).Wikipedia goes on to say that in India, the leaves are called chukkakura in Telugu,and Pundi in Northern Parts of Karnataka (Gulbarga, Bidar, Bijapur etc) in making recipes, such as Chukkakura pappu , a soup made with sorrel and yellow lentils or Pundi Palya , a curry made with sorrel, yellow lentils and peanuts. A popular recipe in early times was the Fasting Day Soup, made of sorrel along with other greens and with eggs, for fasting days when no meat was permitted by the Church. 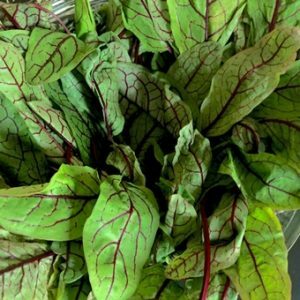 Sorrel thus has a wide geographical spread and has as many names as the regions where it is used as an ingredient. The nutrient and health properties of sorrel are numerous. Sorrel is rich in vitamin C and was of great value as it could prevent scurvy at times when fresh fruits and vegetables were not available. It contains Vitamins A, E, Beta carontene and other carotenoids, as well as potassium which helps in lowering Blood pressure. It is said to have anti inflammatory properties as well as being a diuretic. Sorrel is used medically for reducing pain and swelling or inflammation of the nasal passages and the respiratory tract, as it is said to cause dryness in mucous production and is therefore popular along with other herbs and flowers in treating sinusitis. It is also used to supplement the medication in the treatment of bacterial infections. Sorrel is not advised for consumption by those suffering from arthritis, kidney stones, other kidney related diseases, and during pregnancy. Sorrel is an ingredient in the preparation of certain alternative cancer treatment medications such cancer teas, as well as for cutaneous tumours. Research is ongoing as to its use in reducing the side effects of chemotherapy. The researcher René Caisse, who developed the Essiac tea as a cancer cure, suggested that sheep sorrel was a powerful cancer fighter, and this was supported by the studies made by Dr. Chester Stock at Sloan-Kettering in New York. who wrote that sheep sorrel had properties …”to destroy cancer cells in the body and inhibited metastasis by actually causing cancer cells to return to the original tumor site. ” Caisse believed that sheep sorrel, along with the other herbs in her tea, acted as blood purifiers, carrying away destroyed tissue as well as infections thrown off by the malignancy. 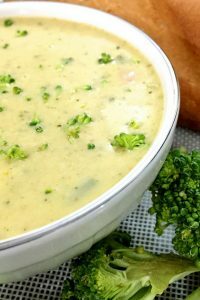 This is a very tasty soup with a subtle citrusy flavour, made in the French style. Potatoes are usually added to Sorrel soup, however I have not done so. Instead I have included in the ingredients, fennel and celery to give a bit of body to the soup, and tarragon and parsley for flavour and nutrition. As it is made in the French style, there is butter and cream too. 2. 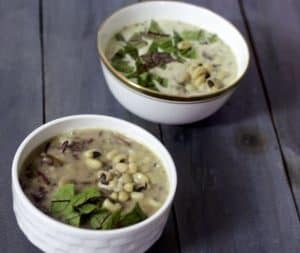 The addition of beans to the sorrel gives a little thickness to the otherwise watery bean sorrel soup. You could puree the cooked ingredients after simmering the stock with the sorrel leaves, but the soup then turns a rather muddy and unappetising colour. As I do prefer my soups chunky, I have not therefore pureed it but have minced the fennel, celery, leek and french beans to keep the ingredients small sized. 3. Sorrel soup is known for its sour taste – (almost like a tart green apple) which is due to the presence of oxalic acid in the leaves (also called “sorrel acid” in Slavic languages) . The sour taste may be negated by adding sour cream to the soup, since oxalic acid reacts with calcium and casein. Young tender leaves are less sour than the older mature ones. 4. 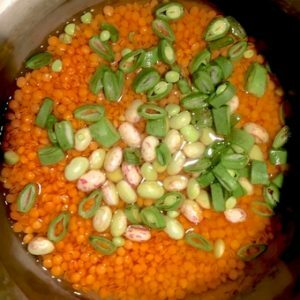 As a variation, egg yolk may be added to the bean sorrel soup and the soup taken off the stove immediately after.